The Supremacy MX comes in packaging which is the same as other Supremacy CPU water blocks from EK. The minute you open the box you are greeted by the Supremacy MX CPU water-block. The packaging is very minimalistic and unlike the Supremacy or the Supremacy EVO, the water block comes with only the mount you ordered. The Supremacy MX comes in a nice and simple packaging with almost everything you need wrapped in plastic. As you can see in the above image, the back-plate, mounting screws, and TIM are all in one neat little package. 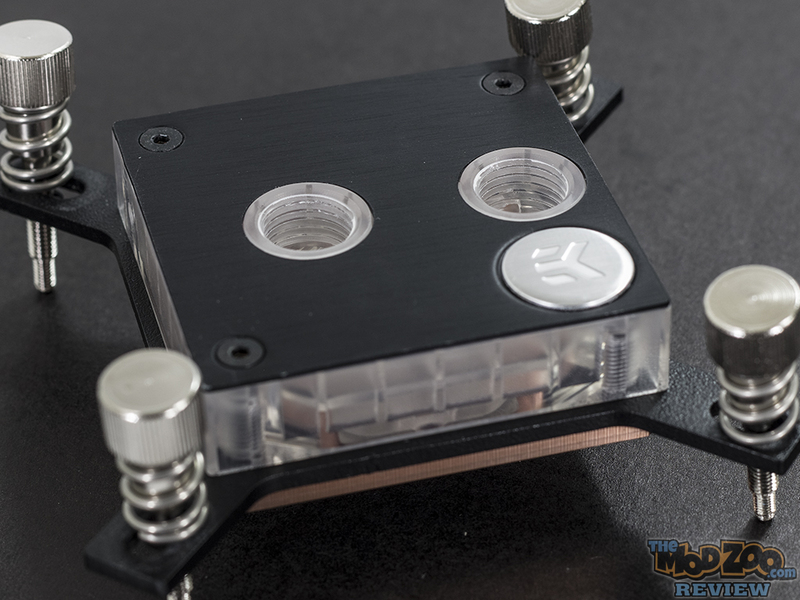 The EK Supremacy MX water-block for Intel mount ships with T-20 Torx key to get the mount installed. With the block out of its packaging, you will notice that the design of the block is very simple and clean on the outside. The mounting thumbscrews are already screwed into the back-plate along with a BAS Washer (pictured above in blue). The Supremacy MX uses a mount that is unlike any other Supremacy series water-block. More on the mount later. Here is a closer look at the water-block. The base is copper, and top of the block is made from acrylic. The water-block does not have in or out marked, which is something I personally like. If you are new to water-cooling or EK CPU blocks then then port that is closer to the middle (left port in the above image) is the inlet and the port closer to the edge is the outlet. The pre-installed mounting mechanism is held in place using a cir-clip. I like this design, and would like to see EK implement this idea across the board. Not having to worry about mounting screws and springs falling makes it easy when it comes to installing the water-block. One of the things that sets the Supremacy MX water-block apart from a lot of other water-blocks out in the market is the removable block plate. In order to take the top plate off, you need to remove the three screws that you can see and the fourth screw that is hidden under the EK badge. The badge is just held in place with some double sided tape. Here is a closer look at the Supremacy MX top plate. The top plate is made from aluminum and is perfect for those who have been wanting to customize their water-block. The plate can easily be painted to change the look of the block as needed. With the top plate removed, this how the block looks. The top of the block is made from cast acrylic and is held in place using four screws from the bottom. Once the top place has been removed, you can easily see the Supremacy EVO cooling engine.